What Causes Heart Disease? What Are the Risk Factors? When Should You Call a Doctor for Heart Disease Symptoms? What Tests and Procedures Diagnose Heart Disease? What Imaging Tests Help Diagnose Heart Disease? What Medications Reduce the Risk of Heart Attack, Stroke, and Angina? What Invasive Medical Procedures Treat Heart Disease? What Surgical Procedures Treat Heart Disease? What Should You Do After Receiving Treament for Heart Disease? What Foods Should You Eat to Prevent Heart Disease and Its Progression? What Lifestyle Changes Help Prevent Heart Disease? How Can You Prevent Heart Disease from worsening? What Is the Outlook for Someone with Heart Disease? How Can Heart Disease Be Prevented? The medical definition of heart disease is any disorder that affects the heart. Sometimes the term "heart disease" is used narrowly and incorrectly as a synonym for coronary artery disease. Heart disease is synonymous with cardiac disease but not with cardiovascular disease which is any disease of the heart or blood vessels. Signs and symptoms of heart disease depend on which condition you have and include chest, jaw, back, or arm pain, particularly on the left side, fainting, and an irregular heartbeat. Coronary heart disease is caused by any problem with the coronary arteries that keeps the heart from getting enough oxygen and nutrient-rich blood. Atherosclerosis is the most common cause of heart disease. Ischemia is the lack of sufficient blood so coronary heart disease is sometimes called ischemic heart disease. Multiple risk factors cause coronary heart disease is related to multiple risk factors. The most common are heredity, high cholesterol and triglycerides, diseases like diabetes, lack of exercise, and a high-fat diet. There are many types of heart disease, for example, angina, arrhythmia, Congenital heart disease, coronary artery disease (CAD), dilated cardiomyopathy, heart attack, heart failure, hypertrophic cardiomyopathy, mitral regurgitation, mitral valve prolapse, and pulmonary stenosis. What Is the Treatment for Heart Disease? Can You Die from It? The treatment for heart disease depends on the cause. Some conditions may be treated with diet, drugs, procedures, and surgery. The life expectancy for a person with heart disease depends on the cause. Some are fatal. The most devastating sign of coronary heart disease is abrupt, unexpected cardiac arrest. Cardiac arrest commonly occurs in people who have had previous heart attacks, but it may occur as the first symptom of heart disease. Most people exhibit some symptom or discomfort. Symptoms usually occur during exercise or activity because the heart muscle's increased demand for nutrients and oxygen is not being met by the blocked coronary blood vessel. Chest pain on exertion (angina pectoris), which may be relieved by rest. More common symptoms of coronary heart disease include palpitations (a sensation of rapid or very strong heart beats in your chest), dizziness, light-headedness, or fainting, and weakness on exertion or at rest, irregular heart beat (arryhmia) and an Irregular heartbeat. Silent ischemia is a condition in which no symptoms occur even though an electrocardiogram (ECG, or heart tracing) and/or other tests show evidence of ischemia. Arteries may be blocked 50% or more without causing any symptoms. No one person usually has all of these symptoms. Sometimes the term "heart disease" is used narrowly and incorrectly as a synonym for coronary artery disease. Heart disease is synonymous with cardiac disease, but not with cardiovascular disease which is any disease of the heart or blood vessels. Multiple risk factors cause coronary heart disease is related to multiple risk factors. The most common risk factors are heredity (coronary heart disease runs in the family); and high cholesterol (levels of cholesterol in the blood are above healthy levels). Usually, it involves high levels of low-density lipoprotein (LDL), the bad cholesterol, and low levels of high-density lipoprotein (HDL), the good cholesterol. Tobacco (cigarettes, cigars, pipes), but also chewing tobacco, obesity, high blood pressure (hypertension), diabetes, lack of regular exercise, high-fat diet, emotional stress, and type A personality (impatient, aggressive, competitive). many types of heart disease, for example, angina, arrhythmia, Congenital heart disease, coronary artery disease (CAD), dilated cardiomyopathy, heart attack, heart failure, hypertrophic cardiomyopathy, mitral regurgitation, mitral valve prolapse, and pulmonary stenosis. Call your doctor if you notice any of these symptoms that suggest it may be angina. Chest pain, pressure or feeling of indigestion after physical exertion, which may or may not be relieved by rest. Shoulder or arm pain involving left, right, or both sides during physical or mentally stressful activity; jaw pain, unexplained by another cause; like a sore tooth; shortness of breath after exertion or walking uphill, fainting spells, and pain in the upper part of your abdomen. Call your doictor if you have nausea, vomiting, or sweating; or palpitations or dizziness and you don't know the cause. The most common symptoms of heart attacks are unremitting or prolonged chest pain, chest pressure, or a feeling like heartburn, shoulder or arm pains (left or right) or upper abdominal pain that won't go away, shortness of breath after minimal activity or while resting, blackout spells, unexplained profuse sweating with or without nausea or vomiting, or frequent chest pain or discomfort at rest. Your first symptom of coronary heart disease may be a heart attack or sudden cardiac arrest. Medical professionals use screening tests to detect the presence and severity of coronary disease before it causes problems or sends you to an emergency department with severe symptoms. The symptoms of coronary heart disease are what medical professionals call nonspecific. This means the symptoms could be caused by many different conditions, and some not related to the heart. The doctor will gather information from you so that he or she can rule out conditions and pinpoint the correct diagnosis. These include asking questions about your symptoms, medical and surgical history, general health and specific medical problems, and the medications you take, phyical exam an electrocardiogram (ECG), and possibly lab tests and imaging tests such as X-ray or CT scan. The doctor will be to rule out a heart attack or other life-threatening condition. The usual tests include blood tests, ECG, and, possibly, chest X-ray. Blood tests might check your blood cells, the chemical makeup of your blood, and enzymes leaking out of damaged heart muscle, that suggest that you are having a heart attack. Other tests might be ordered depending on the circumstances. ECG is a painless test that measures the electrical activity of the heart. It can reveal several different heart problems, including ischemia, heart attacks, rhythm disorders, long-standing strain on the heart from high blood pressure, and certain valve problems. It gives clues as to the underlying cause of cardiac symptoms. The test takes just a few minutes. You lie on a table with electrodes fastened to the skin of your chest, arms, and legs, and a chest X-ray. A chest X-ray can show abnormalities in the size or shape of the heart and can show whether any fluid is building up in the lungs. An ECG involves measuring ECG tracings before, during, and after stressing the heart by exercise. You will walk on a treadmill while connected to an ECG machine. This test is 60-70% accurate in showing blockages in blood flow in 1 or more of the 3 coronary arteries. Sometimes its readings may be falsely abnormal for people taking certain medications or who have certain medical problems not directly related to coronary heart disease. If other tests suggest blockage of the coronary arteries, you may undergo a nuclear (radionuclide) stress test. During this test, after a tiny dose of a radioactive tracer is injected into a vein, a special camera can identify the quantity of blood flow that reaches different parts of the heart muscle. The substance most often used is sestamibi, so this is often called a sestamibi (MIBI) stress test. You will have 2 tests, one with stress, or exercise (on a treadmill), and the other at rest. If you cannot exercise, you will be given a drug to temporarily stress your heart. The drugs used for this are adenosine (Adenocard), dipyridamole (Persantine), or dobutamine (Dobutrex). This test is expensive, but it is noninvasive, and its accuracy is quite good. Results of a nuclear stress test from a person with angina. A significant defect in the amount of blood pumped during stress appears to a major blockage (stenosis) in the right coronary artery. Stress echocardiography is an alternative to the nuclear stress test. Many people prefer this test because it does not use a radioactive agent. Echocardiography is a type of sonar that uses sound waves to bounce off walls and valves, creating an image of the heart as it beats. The movements of the ventricular walls are compared during stress and at rest. Wall motion drops during stress if the coronary artery supplying that part of the heart has significant obstruction. Like the other stress tests, the heart is stressed either by exercise on a treadmill or by administration of a drug. 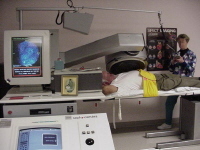 Electron beam (ultrafast) CT scan (EBCT) is a noninvasive but somewhat controversial test. By measuring the amount of calcium deposited in the plaques of coronary arteries, it can detect blockages of only 10-20% of an artery, which may not show up in other tests. Generally, such minor blockages are treated medically; lifestyle changes and risk factor modifications are recommended to prevent worsening of the blockage. Because elderly people frequently have calcium in their coronary arteries without significant narrowing, EBCT is of limited value in this age group. The advantage of EBCT comes in screening young people with one or more heart disease risk factors. Coronary angiography by cardiac catheterization is the best way to evaluate coronary heart disease. You will go to a hospital or an outpatient catheterization lab (for same-day surgery). Under guidance of an X-ray camera, a long, thin plastic tube (catheter) is threaded into the opening of your coronary arteries from a blood vessel in either your groin (femoral artery) or your arm (radial artery). Once the catheter reaches the coronary artery opening, it injects a small amount of iodine dye, which makes the coronary arteries visible on the X-ray screen. 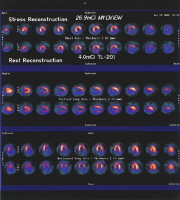 Pictures of the coronary arteries are then recorded in a computer for later review. The images show the diameter of the coronary arteries and any blockages narrowing them. Coronary angiography is an invasive test. In experienced hands, the risk of complications is less than 1%; however, it is the only test that helps a cardiologist to determine precisely whether to treat you with bypass surgery, a less-invasive technique such as angioplasty or stent placement, or medications. Coronary angiography in cardiac catheterization laboratory. Coronary artery disease decreases blood supply to the heart from the blocked coronary artery. The lower blood flow may fail to meet the heart's demand for oxygen. Treatment aims to balance blood supply to the heart with heart oxygen demand, and prevent worsening of coronary heart disease. Aspirin: When taken daily or every other day, aspirin reduces the risk of developing angina or heart attack by reducing the tendency of your blood to clot. It reduces the chance that a clot will form over a rupturing plaque in the coronary artery, a common underlying phenomenon in heart attack (myocardial infarction). Side effects of aspirin include ulcers or bleeding problems. Talk to your health-care professional before starting aspirin. Beta-blockers: Beta-blockers decrease your heart rate and blood pressure, thus reducing your heart's demand for oxygen. Clinical trials have shown prevention of future heart attacks and sudden death. Nitroglycerin: This medication reduces chest pain both by decreasing your heart's oxygen demand and by dilating the coronary arteries, increasing the oxygen supply. Sprays or tablets placed under your tongue are designed to be taken when you need instant relief from angina. Long-acting nitroglycerin tablets or skin patches work slowly over many hours. Calcium channel blockers (CCBs): Calcium channel blockers dilate the coronary arteries to improve blood flow. They also reduce blood pressure, and slow heart rate. ACE inhibitors: Angiotensin-converting enzyme (ACE) inhibitors work by dilating blood vessels, increasing blood flow. They recently have been shown to reduce the numbers of cardiac events, heart attacks, and deaths in people with coronary heart disease, unrelated to their blood pressure lowering effect. Therefore, additional beneficial tissue effects on blood vessels and heart muscle is thought to occur. They are immensely useful in people with diabetes and those with weakened heart muscles. Statins: Statin drugs work by reducing the amounts of lipids (cholesterol and other fats) in your blood. This changes the inner lining of the blood vessels so plaques are less likely to form or get large. They slow or stop the progression of coronary heart disease and also deter repeat heart attacks. Clinical trials have shown beneficial effects immediately after a heart attack or threatened heart attack, even before the fat lowering effect is maximal, meaning they stabilize the plaque. Examples include atorvastatin (Lipitor), pravastatin (Pravachol), simvastatin (Zocor), lovastatin (Mevacor), and rosuvastatin (Crestor). When angina symptoms worsen despite medications, you may need an invasive procedure in the cardiac catheterization lab to clear the blocked artery. These procedures are performed by a cardiologist, not a cardiac surgeon, and have fewer complications. Coronary angioplasty (PTCA): This procedure is similar to coronary angiography (cardiac catheterization or a dye study to visualize the inside of coronary arteries) but is therapeutic as well as diagnostic. A similar but sturdier tube (guide catheter) is inserted into an artery in your groin or arm, and a hair-thin guide wire is threaded through it into your coronary artery. A much thinner catheter is threaded over the guide wire into the blocked artery. This thinner catheter has a tiny balloon at the end.Once the balloon is positioned at the blockage, the balloon is inflated to widen your artery and improve blood flow. The plaque is still there, just flattened against the wall of the artery. The balloon catheter is then withdrawn. PTCA, stands for its full formal name: percutaneous (through the skin) transluminal (through the hollow center of the blood vessel) coronary angioplasty. Stents: A stent is a small, sieved, coil-like metallic tube or scaffold mounted over a balloon. The balloon is inflated at the blockage, which expands the stent. The balloon is then withdrawn, but the stent stays in place, keeping the artery from narrowing again. Like arteries treated with angioplasty alone, arteries treated with a stent can eventually close up again. The stent is a longer lasting solution for many people. Surgery for coronary heart disease is reserved for people whose disease is either severe or is not improved or stabilized by medication and other less invasive therapies. Coronary artery bypass grafting (CABG): This is the standard operation for blockages of coronary arteries. If multiple coronary arteries are blocked, or if the left main artery shows significant blockage, bypass surgery is usually the best treatment choice. The blocked parts of the arteries are detoured or bypassed with blood vessels "harvested" from your chest (internal mammary), arm (radial artery), or a leg (saphenous vein). 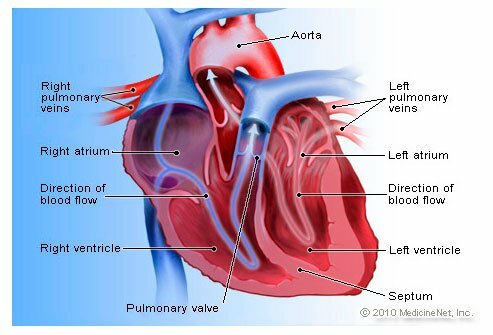 During the surgery, the heart is stopped temporarily and you are connected to a machine called a bypass pump that takes over the functions of the heart. These operations are very successful and have a low rate of complications. Off-pump bypass surgery: Sometimes surgeons can perform open heart surgery without using a bypass pump and while the heart is beating. The procedure causes fewer side effects than the standard procedure, but it is not feasible in all situations. Minimally invasive coronary bypass (MINI-CABS): If just your front or right coronary arteries need bypass, a surgeon may replace the blocked artery with an artery from the leg. Regular follow-up visits with your health-care professional are essential. Coronary heart disease is a chronic (long-term, ongoing), relentlessly progressive disease. Reducing risk factors may only slow its pace. Even angioplasty or bypass surgery only reduces the severity of the symptoms. It does not cure the disease. It often comes back and gets worse, requiring further treatment for people with previous heart attacks or bypass, especially if the person has not corrected the abnormal risk factors. Usually, your doctor or health-care professional will monitor you for any new symptoms or signs of disease progression (periodic physical exams and ECGs or stress tests). Silent ischemia (periodic treadmill or radionuclide stress tests or stress echocardiography). Your doctor will monitor how well your medications, making adjustments as necessary. Side effects of medications will also be monitored and treated if necessary. The American Heart Association recommends that maximum calories from fat be less than 30% of total calories in any meal. Each day, try to eat 6-8 servings of bread, cereal, or rice; 2-4 servings of fresh fruit; 3-5 servings of fresh or frozen vegetables; 2-3 servings of nonfat milk, yogurt, or cheese; and 2-3 servings of lean meat, poultry, fish, or dry beans. Use olive or canola oils for cooking. These oils contain monounsaturated fats known to lower cholesterol. Eat 2 servings of fish each week. Eat fish such as salmon, mackerel, lake trout, herring, sardines, and albacore tuna. All of these fish are high in omega-3 fatty acids, which lower levels of certain fats in the blood and help prevent irregular heartbeats and blood clots that cause heart attacks. Research suggests that alcohol can help protect against coronary heart disease, but limit your intake to 1-2 drinks per day. Higher amounts can increase blood pressure, cause heart rhythm disorders (arrhythmias), and damage your heart muscle and liver directly. Avoiding fast food may not be pleasant or convenient, but it may provide significant benefit in the long run. Smoking: Smoking is the single best change you can make to prevent heart disease. Quitting can be difficult, so seek your health-care professional's help. Passive smoking (breathing in tobacco smoke), smoking cigars, or chewing tobacco are equally dangerous to your health. Physical activity: Exercise helps to lower your blood pressure, increase your level of good cholesterol (HDL), and control your weight. Try to complete an endurance exercise of at least 30 minutes, 3-5 times a week. But just brisk walking alone will improve cardiovascular survival. Exercise can include walking, swimming, biking, or aerobics. Before beginning an exercise program, talk to your health-care professional. Obesity: Excess weight puts extra strain on your heart and blood vessels by increasing blood pressure, plus frequently associated with diabetes, high cholesterol and triglycerides, and low HDL. A high-fiber, low-fat diet and regular exercise can help you lose weight and keep it off. Fad diet programs may be unsafe. Seek your health-care professional's advice before starting any weight loss program. Don't rely on drugs to lose weight. Certain medicines used for weight loss-for example, Fen-Phen-have been associated with dangerous heart valve damage and other serious medical conditions in some users. High blood pressure: If you have high blood pressure, your health-care professional should treat it aggressively. Proper diet, low salt intake, regular exercise, reduction in alcohol intake, and weight reduction are of paramount importance. If your health-care professional prescribes medications, take them faithfully. Diabetes: Diabetes causes blockage and hardening (atherosclerosis) of blood vessels everywhere in the body, including coronary arteries. Controlling diabetes significantly reduces coronary risk. Viagra and coronary heart disease: If you intend to use sildenafil (Viagra) for erectile dysfunction, contact your doctor to make sure it is safe for you. If you have a significant coronary blockage, angina or heart attack may occur with use of Viagra. Also, you must avoid taking nitroglycerin in any form-pill, patch, or spray-within 48 hours of taking Viagra. Using Viagra with nitroglycerin may cause dangerously low blood pressure. If you have coronary heart disease, following the recommendations of your health-care professional is very important if you wish to improve your condition or prevent it from getting worse. If you notice any change in your condition, you may need further diagnosis or treatment. The most important ways to reduce the risk of heart disease are in your control, not the control of your health-care professional. Lifestyle changes are the most powerful way to prevent heart disease from getting worse or of reducing the risk of getting heart disease in the first place. The phenomenal drop in the heart disease death rate over the past 30 years has been due more to reducing risk factors than to advances in treatment. Ways to lower the risk of heart disease. Eat a heart-healthy diet: This is the most important step you can take in lowering your risk. Lower your fat intake: Calories from fat should be less than 30% of your total calorie intake every day. This translates to less than 60 grams of fat per day for an adult. Lower your blood cholesterol to the recommended level, especially the LDL cholesterol: This keeps plaque from building up within your coronary arteries. Engage in regular exercise: This can reduce your risk of heart disease. Exercise strengthens the heart, makes it more efficient, and lowers your blood pressure and bad cholesterol (LDL), yet raises you good cholesterol (HDL). 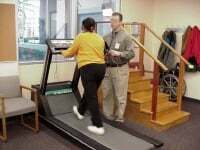 Check with your health-care professional before beginning an exercise program. The American Heart Association recommends at least 30 minutes of exercise 3-5 times a week. Quit smoking: This also provides a very striking benefit. After only 3 years of not smoking, your risk of heart disease drops to that of a nonsmoker. Your health-care professional can help you quit smoking by providing guidance on changing your behavior. Certain medications have been shown to help some people quit smoking. Control high blood pressure and diabetes: If you have diabetes, keep your blood sugar under control every day. You should know the value of your HbA1c, a measure of how your blood sugar is controlled; it should be less than 7.0. Take a low-dose aspirin daily: This can reduce your risk of heart attack. With aspirin, there is some risk of bleeding, so ask your health-care professional before taking aspirin daily. No scientific clinical trial in humans has shown a beneficial effect of vitamins on the heart. Note that hormone replacement therapy (HRT) was used for many years to prevent coronary heart disease and heart attack in women who had gone through menopause. Replacing certain hormones was thought to provide a heart-protective effect enjoyed by women before menopause. A research study that ended in 2002 found, however, that women who took HRT actually had higher rates of heart disease and stroke than women who did not take HRT. HRT is no longer recommended for prevention of heart disease. Soy products help reduce LDL cholesterol. Eat a fruit plate or low-fat yogurt for dessert. Cut sweets and sugars to a minimum. Cook foods in olive oil or canola oil, which are high in monounsaturated fats. These fats decrease LDL and total cholesterol levels. Eat 1 or 2 servings of fish or seafood each week. Eat nuts that are rich in monounsaturated fats, such as hazelnuts, almonds, pecans, cashews, walnuts, and macadamia nuts. These nuts are healthful but high in fats. They should be eaten in small amounts. Cooking foods with garlic, which may have a slight cholesterol-lowering effect. No more than two drinks per day for men and 1 drink per day for women is recommended to raise the good cholesterol (HDL). However, some people should not use alcohol. People who have liver or kidney problems, certain other medical problems, problems with alcohol abuse, or who are taking certain medications should not use alcohol. If you do not use alcohol, most medical professionals would recommend that you not start just for the benefits to your heart. If you have any questions about alcohol's positive and negative effects on your health, ask your health-care professional. Recovery from coronary heart disease depends on many factors. The extent of coronary artery disease and number of coronary arteries involved. The history of previous heart attacks or bypass surgery. The capacity for exercise or exertion, heart function - how well the heart contracts, and acuteness of symptoms. Call 911 or go to your nearest Urgent Care or Emergency Department if you have angina, unstable angina, or a heart attack. Risk refers to the odds that something will occur, but there are no guarantees. Having one or more risk factors does not mean heart disease is inevitable. Similarly, absence of risk factors does not guarantee you will not have heart disease. Monitoring and modifying certain risk factors is the best way to prevent coronary heart disease. If possible, adopt a healthy lifestyle early in life. Because risk factors are interrelated, many are present together in the same person, thus, moderate changes in one area of your life often reduce other risk factors at the same time. Unfortunately, you can't change some risk factors. Men older than 45 years and women older than 55 years are at increased risk for coronary heart disease. If someone in your immediate family has had coronary heart disease, angina, or heart attack by age 55 years, your risk of developing heart disease is increased. If heart disease runs in the family, talke to your doctor about genetic counceling. You can change risk factors by eating trans fats ("healthy fat"). Lower youir cholesterol and triglycerides, eat a healthy diet, quit smoking, control diabetes, control high blood pressure, lose weight, get more exercise, and reduce your stress by using stress management techniques. Medically reviewed on January 23, 2018. Yang, EH, MD, et al. Cardiovascular Disease Primary Prevention/Lifestyle Guidelines. Mescape. Updated: May 25, 2018. What was the cause of your coronary heart disease? What symptoms have you experienced with heart disease? Please share what prevention measures your currently use to keep your heart disease from getting worse.